Don't feel like reading Clare's LONG post? CLICK HERE to go straight to the Morrocco Method Website! I get lots of requests to share what I do with my crazy head of curly hair. I wanted to first apologize for being a terrible blogger! I know I hardly ever post to this blog but I want to try to change that! Thank you for following us on Instagram and Facebook! Due to the large amount of interest shown on those outlets, this blog post is on the longer side because I wanted to give you more information than you have gotten from my Instagram @flametofork and from my personal one @oohhclare. I have a lot of fine, curly, dry, slow-growing, shoulder length hair. Before I get started, the answer is, no…. I am NOT sure that these methods will work with your fine, straight hair….heck... I am not even sure these methods will work with your hair that looks EXACTLY like mine! Everyone's hair is different. Take into consideration lifestyle, climate and the water you have in your shower and its pretty much impossible for one person to experience results EXACTLY as someone else. However, I do think there is some excitement to be generated when you see someone who has a positive review of a product or method. Reading other peoples reviews and methods is exactly how I ended up here and even how I ended up Paleo! You have to research, experiment, research more, experiment more, and continue this cycle until you find what is perfect for you!!! BEFORE going all natural with my haircare…..
AFTER going all natural with my haircare: Here I am now. Rocking my natural God-given hair color (with the help of a mix of Medium Brown and Dark Brown Henna on the blonde ends!) and keeping my hair chemical free! With that being said, I want to share with you what WORKED for ME in the past and currently! Here is a little back story: I have been in a 29 year fist fight with my hair. I all through middle school and high school in denial that I had curly hair. I would spray a full can of hairspray on my hair before use a scalding curling iron to flatten it. I slathered it with "sun in" to get those sun kissed locks (if you consider missing parts of your hair sun kissed). When that turned orange, I would go to the local wal-mart and purchase the cheapest hair dye money could by to fix the damage. 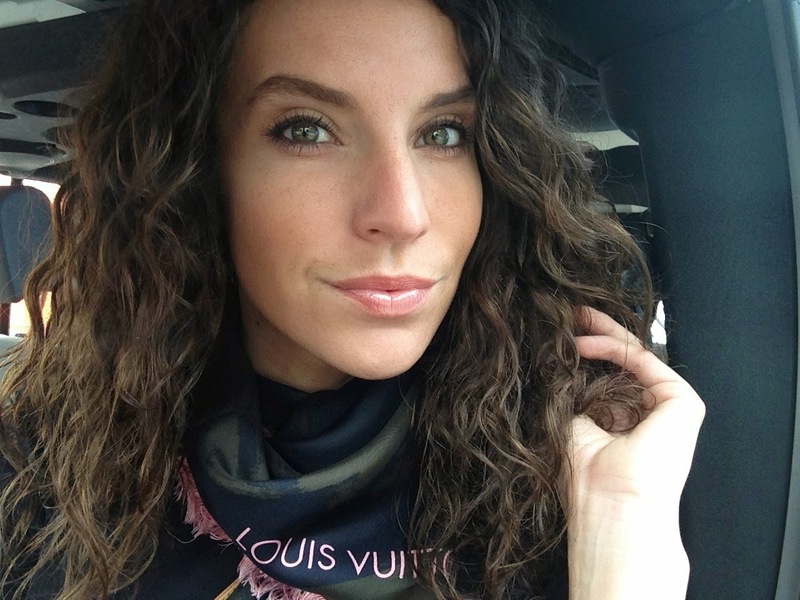 Into high school I began to accept my curly hair and found the miracle product that worked for me (and by "found the miracle product" I mean, tried probably thousands of dollars and every single mousse on the market). This product was $3.99 Herbal Essence Mousse special for curly hair. I would go through a can of these a week. It was the only way to get my hair looking perfect. Nothing could beat this four-buck chuck miracle mousse. I used a can a week from the age 15-28. 13 years of using this product, I should be part owner! In addition to my poor choice of hair care, I was also doing anything I could to try to lose weight and spent years dieting and restricting my caloric intake so much that I believe it contributed to many of my skin and hair issues. The bottom line is anything damaging I could have done to my hair, I did it. ..... And I did it for many years. Here is me in early 2011, at the height of my damaged/over processed hair fight (pre-paleo and natural hair/skincare routine). My natural curls lost a lot of their bounce and my hair never could get longer than this length, ever! I first started no-poo and went full force into it in June of 2013. I wanted to start with the baking soda wash and apple cider vinegar method but kept reading horror story reviews, so I started with a mix of coconut milk and aloe vera. The idea was that this was more of a shampoo and conditioner all in one and it was going to make my hair stronger and healthier. It worked miserably for me and my hair never felt clean at all. Eventually I bit the bullet and went for the baking soda, apple cider vinegar route. I LOVED this. Washing my hair this way left it cleaner than I have ever felt before, even using regular old shampoo! It left my hair soft and shiny as well and my bounce came back! My specific concoction was to take two mason jars and fill one up with a mix of 1T baking soda and the rest filtered water, and the other jar with 1T ACV and the rest with water. The baking soda mix I would let sit and massage into my head, then rinse. The ACV I would just dump over my entire head and massage out while quickly diving under the shower head. (I found that if I left the ACV on any longer than a flash, it made it sticky and oily) This method is documented in the Skintervention Guide, so Click HERE for more info on that!! This was how my hair looked after my first two months of going "no poo", using zero hair product and only washing once every 10 days. The reason I was doing all of this was to make my hair healthier! Flash forward to 9 months later and while I do notice my hair "seems" healthier…it still isn't growing very fast, I was still experiencing breakage and my biggest pet-peeve was that the color was somewhere in between natural brown and old grown-out highlights. In addition, I missed the smell-good hair products. :( It also was sometimes to travel with my no-poo care kit and to easily mix the concoction of baking soda and ACV. Basically, I missed normal haircare!!! I wanted to be able to have that relaxing, smell-good, spa-type experience when I shampoo and take care of my hair, instead I felt like I was just one big science experiment. The old blonde was starting to grow out and it REALLY bothered me how tacky it looked, but I was determined to not go back to my old chemical-ways! The last time I had my hair highlighted or touched in a salon was January of 2013…. Being over a year since that day, my hair sure had grown out and I had what I liked to call "ghetto grade ombre" going on. I really wanted to hide that, but didn't want to put chemicals back into my hair since I had safely transitioned to no-poo. I started researching companies that offered natural solutions to hair dye. I tried soaking my hair in coffee grounds and water, but that left little results. I finally stumbled up on Morocco Method and their henna color which claimed not only to color your hair, but to give it a deep conditioning and detoxifying treatment at the same time. I ordered two colors "Medium Brown" and "Dark Brown". I was so excited to try! It worked out great as you can see! The process was a bit overwhelming at first. They require you to mix the ingredients 6 hours ahead of time and to allow it to "set". Once set it needs to sit on your hair for 2 hours! Throw in that you can't use any metal utensils, need gloves, and kind of have to figure out a scoop and distribute method that works for you and it seems like a lot of effort right? Well, the first time it was, but every few weeks I do another treatment and it becomes easier to do each time. The BEST part (in addition to the amazing color result) is that the air is easy to breath while you are processing! No more crazy chemicals smelling up your house! The results were subtle and looked totally natural! I had successfully covered the old highlights to keep my hair looking classy and healthy as it grows out. 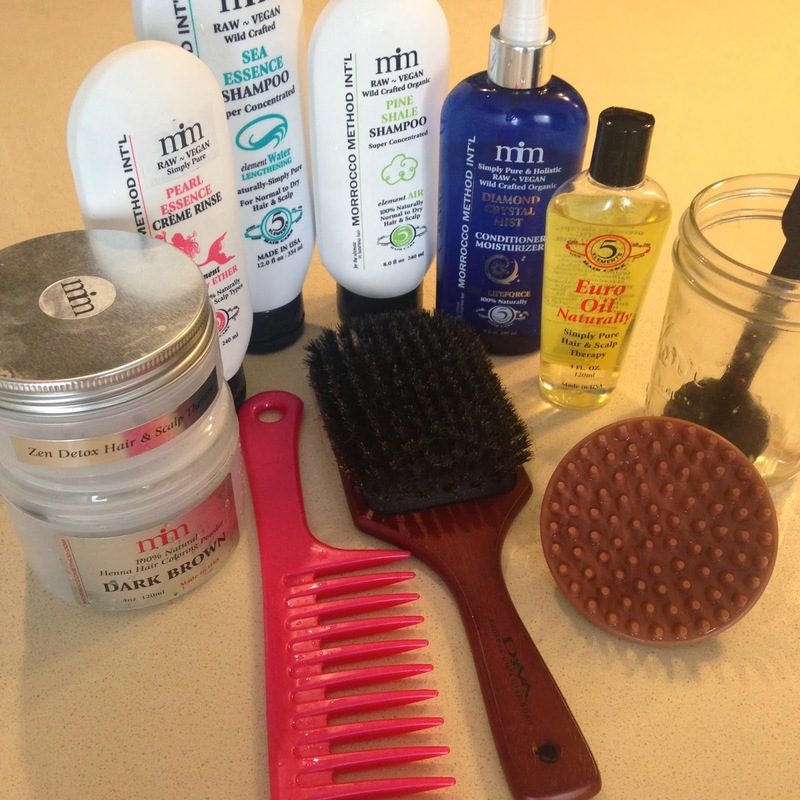 These are all the products that I first purchased from Morrocco Method. I was so excited to get my box that I started right away with their prescribed method for my curly hair. If you are unsure of what products to order I would recommend emailing them. They have excellent customer service and are very helpful in helping you order according to your hair type and what you are trying to accomplish. I ordered two types of shampoos (Pine Shale and Sea Essence), Pearl Essence conditioner, Euro Oil, Diamond Crystal Mist, and the Zen Detox. The first thing I did that was WAY different from my previous no-poo routine was I bought a boar bristle brush and brushed my hair. This is something I NEVER did in the past, and by never I mean…literally never. I didn't even own a brush. But the Morrocco Method suggests that even curly haired gals brush nightly to invigorate the scalp and help to clean and distribute oils. The basic rule of thumb is to flip your head upside down and begin brushing from the nape of your neck, and flip back over and continue until your oils have been well distributed. I was so amazed at how this worked! I wish I would have done this while I was transitioning to No-Poo as it really did help remove oils from my scalp. In the morning after brushing out my crazy hair at night, I would just wet my hair during my morning shower and the curls would regain their order and be good for at least a week before having to wash again! The other two products pictured in the photo above are what they consider "hair treatments". The henna I already had but I also purchased the Zen Detox clay treatment that is supposed to really deep detox and moisturize your hair and scalp. I have used both and really enjoy the process. My hair ALWAYS turns out softer and my scalp feels really fresh and clean. I plan on doing both of these treatments monthly and brushing nightly from now on. 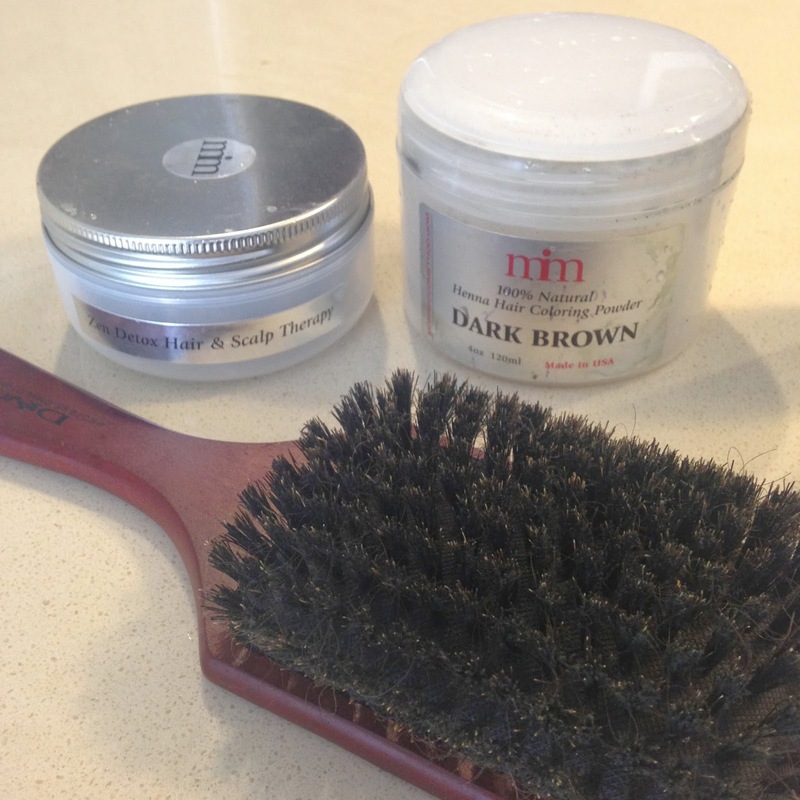 The tools you will need to wash your hair with this method are a scalp massager (which they also sell on their website) a mason jar and a spoon to mix and dilute the shampoos (since the shampoos are super concentrated). Note that these shampoos do NOT lather at all, so it may take a little getting used to. They suggest shampooing twice and using about the size of a quarter each time. I put the shampoo in the jar and mix it up with about 6oz of water. I dump that over my head and get massaging! It feels really good and it helps to loosen the dirt. After doing this twice, I apply the pearl essence to the ends of my hair and go on with my normal shower-business while the conditioner sits for anywhere from 5-10 minutes. Once I rinse the conditioner out of my hair I give my hair a good shake and spray the Diamond Crystal Mist onto my hair with about a dime size amount of Euro Oil. If I have a hard time using my fingers to get through my hair, I use the wide tooth comb and gently detangle. 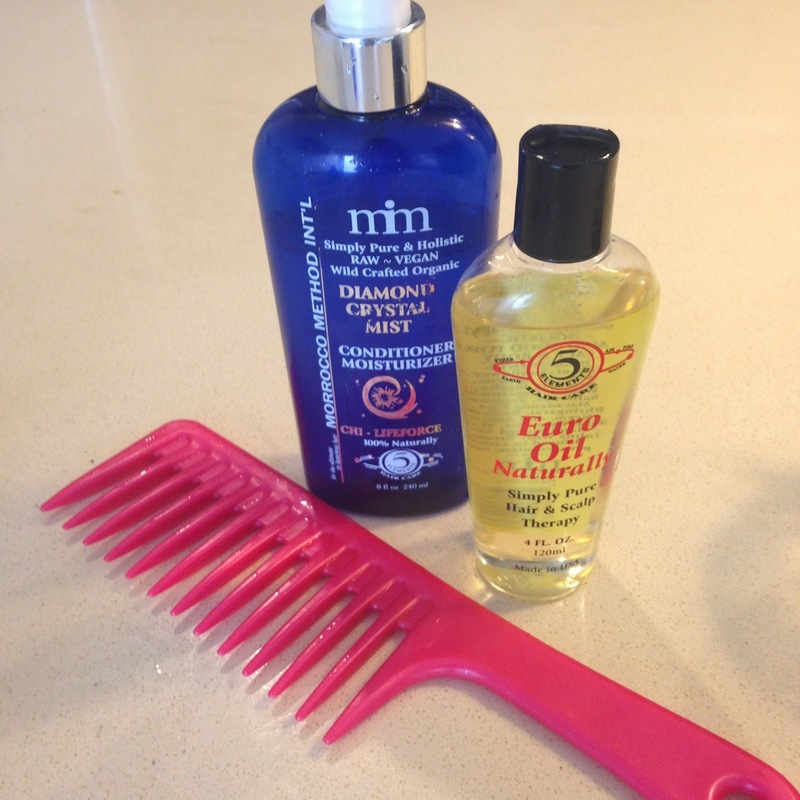 The Euro Oil and Diamond Crystal Mist work wonders to detangle! (ps, the Diamond Crystal Mist is my favorite product so far!! I have used it every day!) I also mix the Euro Oil with a small amount of the Blood of the Dragon Styling Gel and let it air dry, or I use a diffuser on the lowest heat setting. 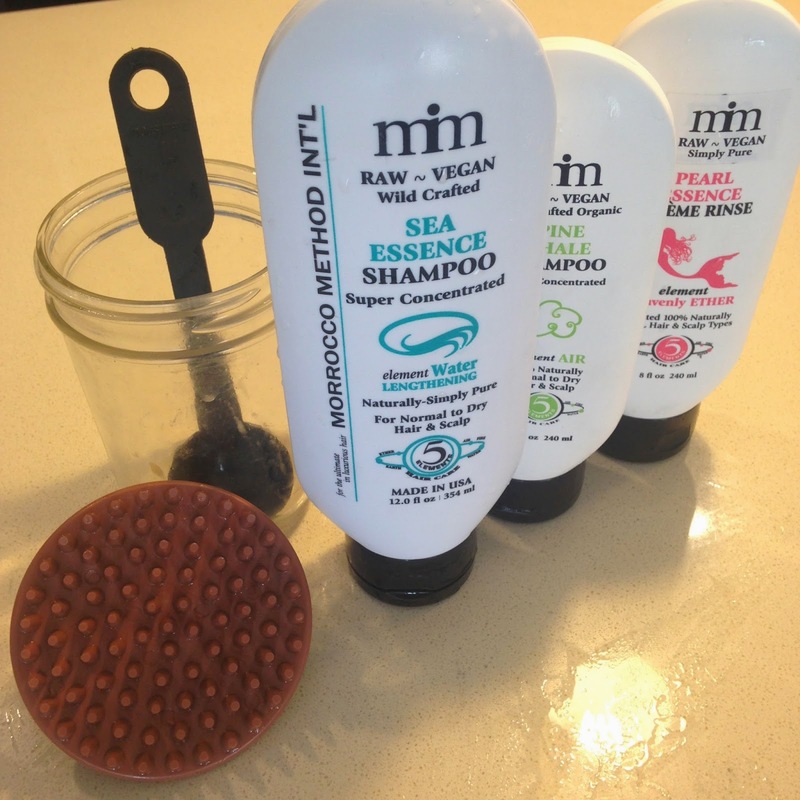 One of the other reasons I really liked the Morrocco Method was because they are an insanely awesome resource for all things hair-care. They have tons of tutorials, videos and a huge FAQ section. In addition to satisfying my need for information, they also satisfy my desire to support companies doing good things. They donate a percentage of their profits to all sorts of great organizations and that is something that I love! I am still new to the Morrocco Method but so far (a month in) I am really loving all of the results. I am hoping that in a few months time I will really start to see some hair growth and continue to share my results with you! I would be glad to answer any questions you might have and invite you to follow my personal instagram at @oohhclare for more on my no-poo journey as I tend to share most things non-food related there! I hope you enjoy experimenting with these wonderful products as much as I am! Keep me updated on your no-poo hair journey as well! I love hearing your comments!